Does Oil Come From Dinosaurs? In 1933, the Sinclair Oil Corporation sponsored a dinosaur exhibit at the World's Fair in Chicago on the premise that the world's oil reserves were formed during the Mesozoic Era, when the dinosaurs lived. The exhibit was so popular that Sinclair promptly adopted a big, green Brontosaurus (today we'd call it an Apatosaurus) as its official mascot. Even as late as 1964, when geologists and paleontologists were starting to know better, Sinclair repeated this trick at the much bigger New York World's Fair, driving home the connection between dinosaurs and oil to an entire generation of impressionable baby boomers. Today, Sinclair Oil has pretty much gone the way of the dinosaur itself (the company has been acquired, and its divisions spun off several times; there are still, however, a few thousand Sinclair Oil gas stations dotting the American midwest). The premise that oil originated from dinosaurs has been harder to shake, though; politicians, journalists, and even occasional well-meaning scientists have repeated this myth. Which prompts the question: Where does oil really come from? You may be surprised to learn that oil reserves were actually produced by microscopic bacteria, not house-sized dinosaurs. Single-celled bacteria evolved in the earth's oceans about three billion years ago and were pretty much the only life form on the planet until about 600 million years ago. As tiny as these individual bacteria were, bacterial colonies, or "mats," grew to truly massive proportions (we're talking thousands, or even millions, of tons for an extended colony). Of course, individual bacteria don't live forever; their lifespans can be measured in days, hours, and sometimes even minutes. As the members of these massive colonies died off, they sank to the bottom of the sea and were gradually covered by accumulating sediment. Over millions of years, these layers of sediment grew heavier and heavier until the dead bacteria trapped below were "cooked" by the pressure and temperature into a stew of liquid hydrocarbons. This is the reason the world's largest oil reserves are located thousands of feet underground and not readily available on the earth's surface in the form of lakes and rivers. When considering this, it's important to try to grasp the concept of deep geologic time, a talent possessed by very few people. Try to wrap your mind around the enormity of the figures: bacteria and single-celled organisms were the dominant forms of life on earth for a whopping two and a half to three billion years, a virtually incomprehensible stretch of time when measured against human civilization, which is only about 10,000 years old, and even against the reign of the dinosaurs, which lasted "only" about 165 million years. That's a lot of bacteria, a lot of time, and a lot of oil. Okay, Forget About Oil—Does Coal Come From Dinosaurs? In a way, it's closer to the mark to say that coal, rather than oil, comes from dinosaurs—but it's still dead wrong. Most of the world's coal deposits were laid down during the Carboniferous period, about 300 million years ago—which was still a good 75 million or so years before the evolution of the first dinosaurs. During the Carboniferous period, the hot, humid earth was blanketed by dense jungles and forests; as the plants and trees in these forests and jungles died, they were buried beneath layers of sediment, and their unique, fibrous chemical structure caused them to be "cooked" into solid coal rather than liquid oil. There is an important asterisk here, though. 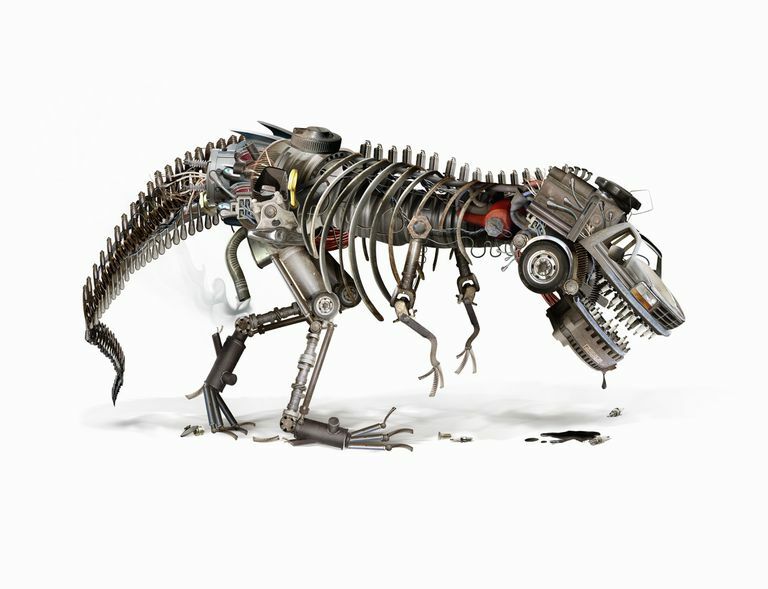 It's not inconceivable that some dinosaurs perished in conditions that lent themselves to the formation of fossil fuels—so, theoretically, a tiny proportion of the world's oil, coal, and natural gas reserves could be attributed to rotting dinosaur carcasses. You just have to bear in mind that the contribution of dinosaurs to our fossil fuel reserves is orders of magnitude smaller than that of bacteria and plants. In terms of "biomass"—that is, the total weight of all the living organisms that have ever existed on earth—bacteria and plants are the true heavyweights; all other forms of life amount to mere rounding errors. That's all well and good, you might think—but how do you account for all the dinosaurs (and other prehistoric vertebrates) that have been discovered by work crews searching for oil and natural gas deposits? For example, the well-preserved fossils of plesiosaurs, a family of marine reptiles, have been unearthed near Canadian oil deposits, and a meat-eating dinosaur accidentally discovered during a fossil-fuel drilling expedition in China has been given the well-deserved name Gasosaurus. There are two ways to answer this question. First, the carcass of any animal that has been compressed into oil, coal, or natural gas wouldn't leave any identifiable fossil; it would be entirely converted into fuel, skeleton and all. And second, if the remains of a dinosaur happen to be discovered in the rocks adjoining or covering an oil or coal field, that simply means the unfortunate creature met its end hundreds of millions of years after that field was formed; the precise interval can be determined by the relative location of the fossil in the surrounding geologic sediments.